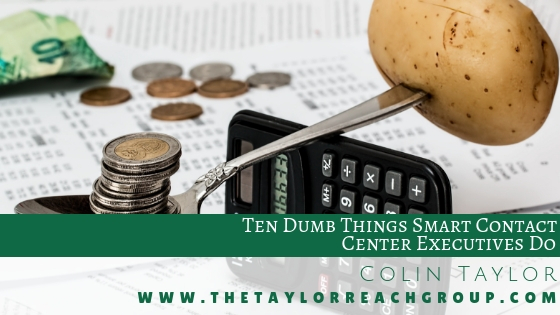 Ten Dumb Things Smart Contact Center Executives Do | The Taylor Reach Group Inc. There are a lot of smart — very smart — individuals managing and directing Call and Contact Centers today. Yet these bright, bright people still manage from time to time to do things that defy understanding. This is my top ten list of really dumb things that smart call and contact center executives do. If you have any dumb things to add to the list let me know or comment below. 1. Not investing in training or professional development. 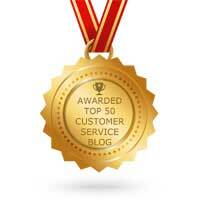 Contact Center staff is one of the most expensive and important assets within the Contact Center. 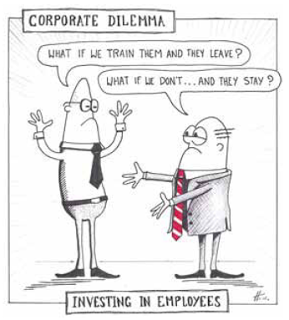 Companies spend money on initially training new hires, but is that enough? “They’ll figure it out. Besides, we can always use the dollars allocated to training for other areas like executive retreats” – a prime example of the mindset you do not want to take as a Contact Center executive. It is important to invest in on-going professional development at all levels within the Contact Center. 2. Not staying current on new technologies impacting Call and Contact Center operations. After all why would we want home agents, speech recognition, higher quality or better staff morale and management? I hope you can sense my sarcasm here. Keeping current on Contact Center technologies will allow you to understand where these technologies can be applied to increase customer satisfaction, improve KPIs, reduce costs and/or optimize Contact Center operations specific to your organization’s desire. 3. Not reading trade press, blogs and newsletters. “We already know everything, and besides who has time to read when I am constantly in meetings.” – again, this is a poor mentality for a Contact Center executive. Keeping current on all things Contact Center related is essential. 4. Not including remote staff in your operational budget. “There aren’t very many of them out there…is there?” Wrong. In today’s society, especially with a large portion of the workforce being comprised of millennials, working remote is becoming increasingly desirable. If properly executed and dependent on your company or industry, staffing remote agents or WAHA (work at home agents) can assist with optimizing your workforce in terms of performance and schedules while improving performance, adherence to forecasts and employee satisfaction. 5. Not sharing new technologies and their capabilities with senior management. “They will just say no, so what is the point.” Again, wrong. Understanding recent advancements in the technology world of Contact Centers, and having the ability to share this knowledge with senior management, will not only show initiative on your part, but also can present some new opportunities for your Contact Center. 6. Not sharing ideas concepts and results with Marketing. 7. Not considering the agents’ point of view when you examine new technologies. 8. Not giving agents the authority to make any decisions. It is important that managers make all decisions…I know it is only a $.49 credit, but it’s the principle of the thing. Tim Ferriss, author of The 4-Hour Work Week, famously told his outsourced agents that if a problem cost less than $100 they should fix it themselves. 9. Not taking a long term view of your incentive program. Incentive programs are designed to generate short term results. I just don’t understand that while our incentive to reduce average handle time was so successful our call volume increased substantially. 10. Not sharing with HR the staff and skills/competencies that work best in the center. Turnover is a part of life in a contact center so we shouldn’t try to address it. Lack of time: The old saw that “meetings are a nice alternative to work” rings true in many organizations and contact center are not exempt. Days filled with meetings, limits interaction with direct reports, free time to review news stories, white papers, technology articles etc. it also reduces time to speak with industry peers, to attend conferences or seminars. All of this leads the manager little option but to continue to rely on the status quo in operations as this is the only environment the manager is comfortable and knowledgeable about. Conflicting objectives: Often contact centers are asked to deliver multiple objectives simultaneously: improve customer satisfaction and reduce costs, or increase first call resolution, but don’t spend anything on additional training. These examples of conflicted objectives are frequent occurrences in contact centers today. Mission Statements focus on “providing world class customer service”, but the contact center receives no budget to deliver this. Unclear objectives: Centers are often charged with broad mandates to “deliver excellent customer care” but benchmarks and standards are not defined to allow the contact center to know how success will be measured. Each of the above three examples leads the contact center management to revert to what they are most comfortable and those things that they can quantify without ambiguity. Further they tend to focus on the short term as there is no clear long term vision or plan. In short this is what they have done before and what they are doing now. This approach is not conducive to looking forward or acting proactively. To the contrary this approach ensures that the management focuses on the past. The end result is bright contact center executives then make dumb decisions.